The time is Six o’clock in the morning. I am wide awake already, as bright sunlight filters through the curtains. I get up and slide one of the curtains. I see a typical village scene outside, seen anywhere in India; fields, mud tracks, cows and goats being taken for grazing. Yet it looks incredibly beautiful. I can also see hotel’s beautiful garden with many variety’s of roses. The night has not been very chilly. I get up and first thing that I do is check up my camera batteries. These are charged fully, which means that there was power available throughout the night. I switch on the boilar and have a nice hot bath. After I am ready, I decide to go out for a walk. Ever since Pune (my home town) became a busy metropolis, I have missed the lovely walks, I used to have in the vicinity of my house. After so many years I am having a leisurely walk today on this road without any traffic, horns and buzzing vehicles. The road is wooded on both sides. There is a small culvert built on a picturesque spring of water. I take a pause. Through a gap in the foliage, I see ahead a very tall mountain. On top of this mountain, I see a white Gompa or monastery, which I think is the Hundar Monastery. Immediately behind the white Gompa, there is a majestic snow clad peak, glistening in the golden rays of early morning sun. I stand still and watch the grand spectacle arranged by mother nature for me. I return to the hotel for breakfast, which consists of egg omelets, crisp bread and apricot jam. I again meet the troupe leader of the gang of bikers. They are off today to Leh, but would be passing through the Digar pass, which is lower in height but takes longer distance. I finish my breakfast and we too leave for Leh. Our first stop on the way is silver sands of Hundar, just outside the village. 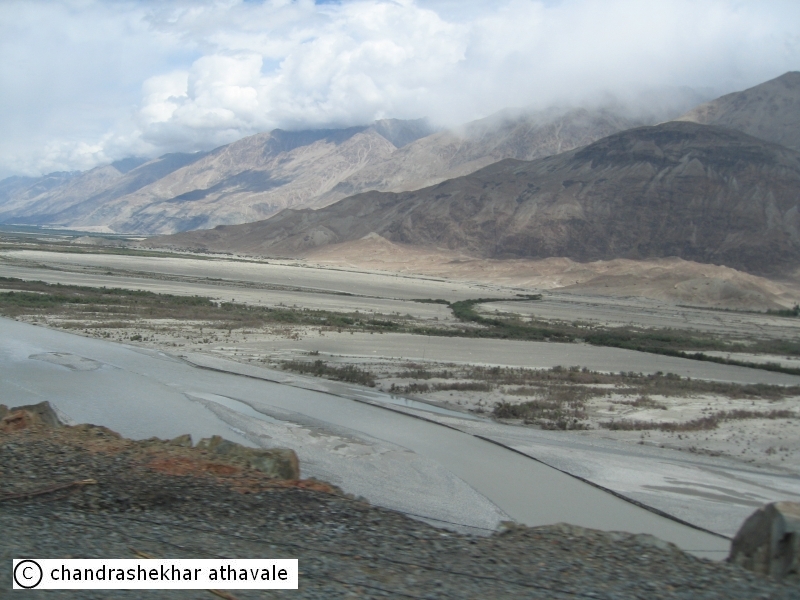 We are back again in the desert land of the Shyok valley. It is really a huge stretch of land. On the east side, tall mountains of the Saltoro ridge, stand majestically with many snow clad peaks. 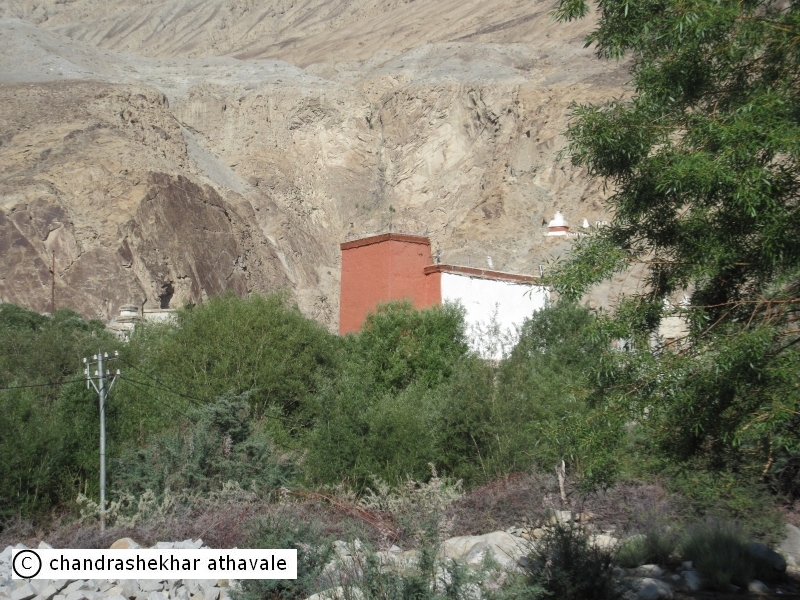 On the west, yellowish red sandy mountains of the Ladakh range stand. In between these two, the flats stretch up to a line of green foliage at the base of the mountains. White sand dunes formed by the severe wind, which blows here most of the time, appear like ripples on a sea of milky white colour. Tundup points out to a big heard of camels relaxing in the morning sun. They are all sitting with their hind legs folded like a baby. I am not very keen about riding camels anyway. Some other tourists seem to enjoy the ride. This camel is known as Bactrian camel and is usually found in northern regions of Afghanistan, which were known as Bactria. 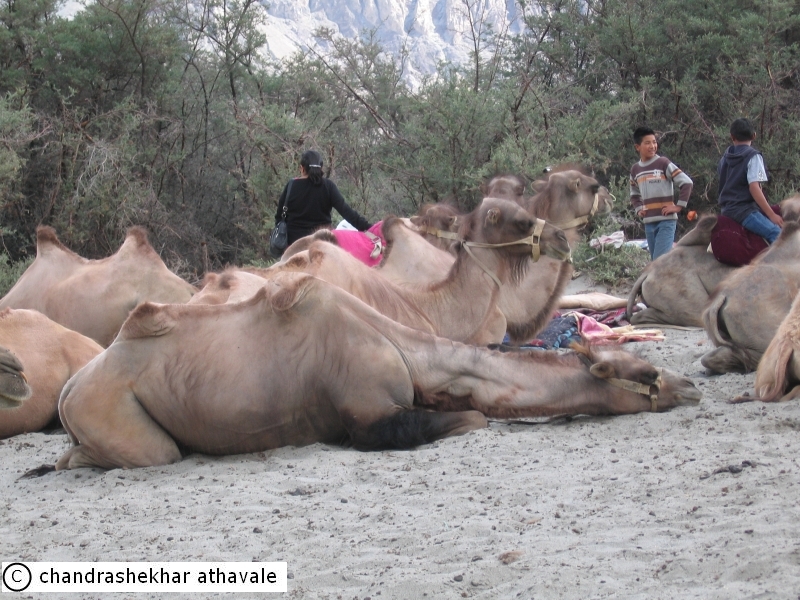 No one knows for sure as to how they migrated to Ladakh. There is a theory that Kushan king Kanishka’s army brought them here from Gandhar region of present day Pakistan. 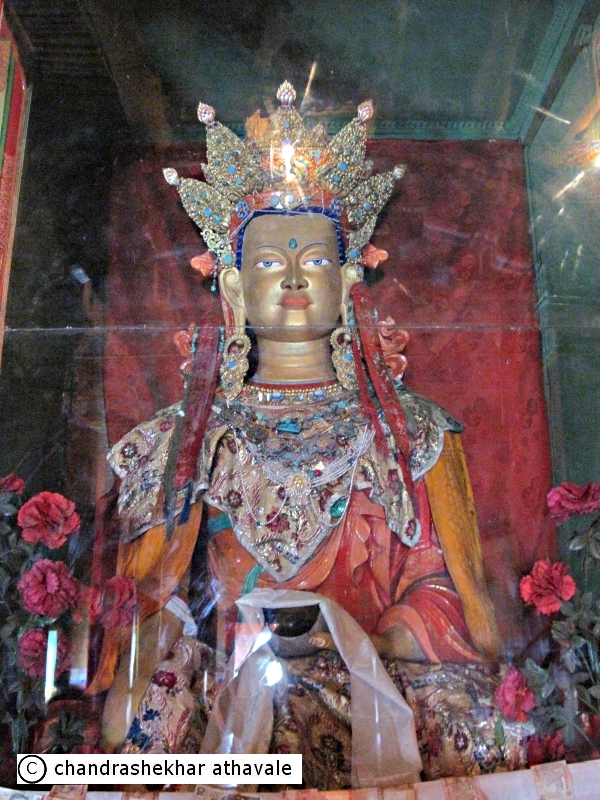 This monastery was founded by Sherab Zangpo in the year 1420. There are two wings on the top, separated by a veranda. 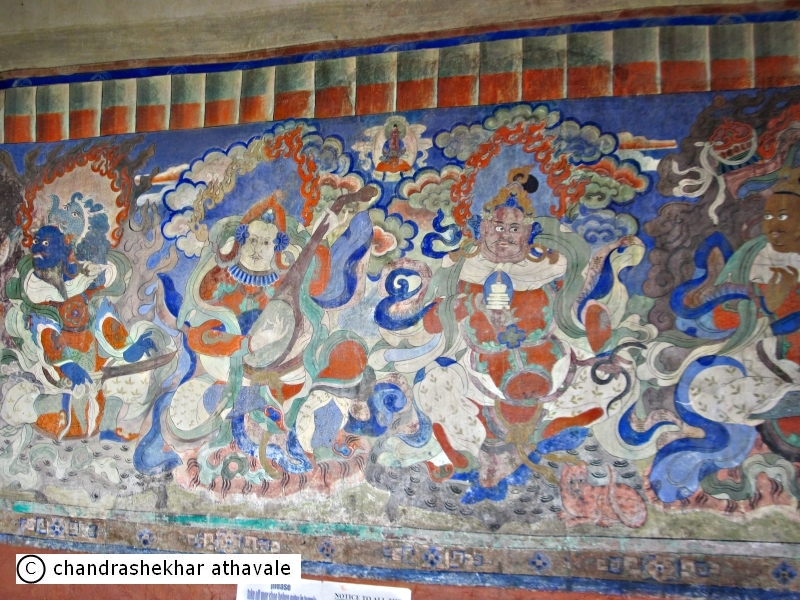 The veranda wall has paintings of Guardian kings of cardinal directions. 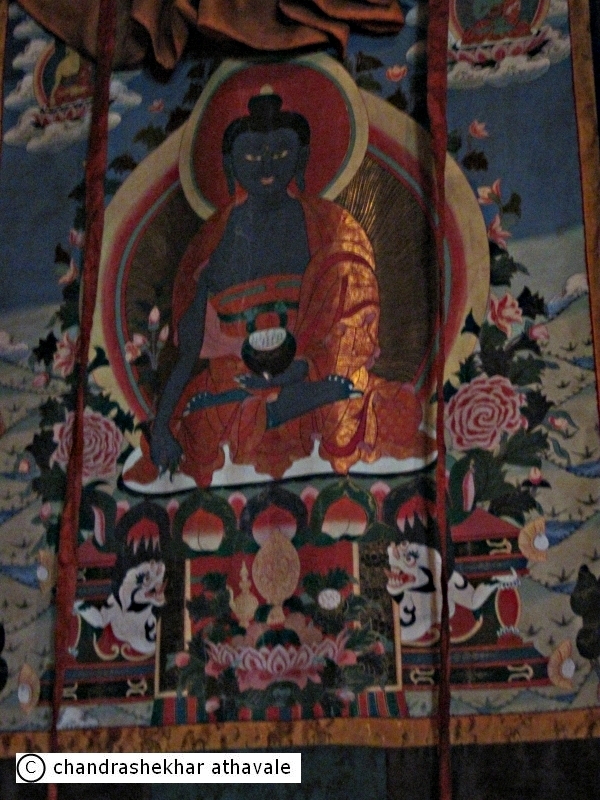 A Lama informs me that the paintings have been made entirely by paints made by crushing various coloured stones. The room on the right hand side is the old Du-khang. 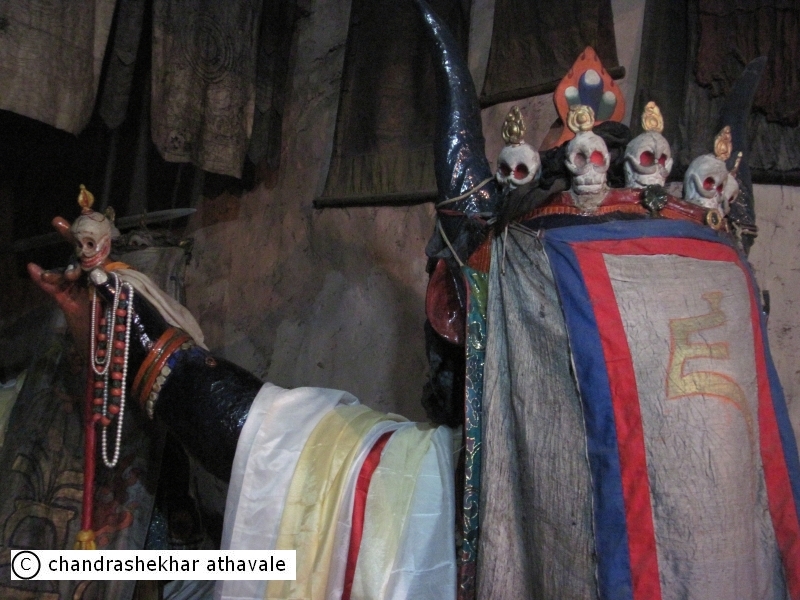 The main deity here is Gonkar, one of the wrathful and fierce deities. The deity is shown here with the chopped hand of a Mongol invader. 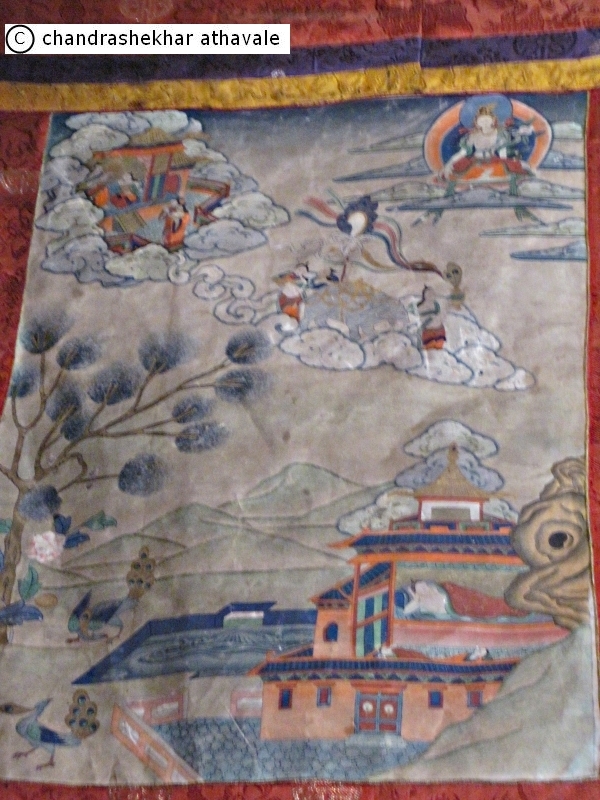 There are few extremely precious paintings here of Tibetan monasteries. 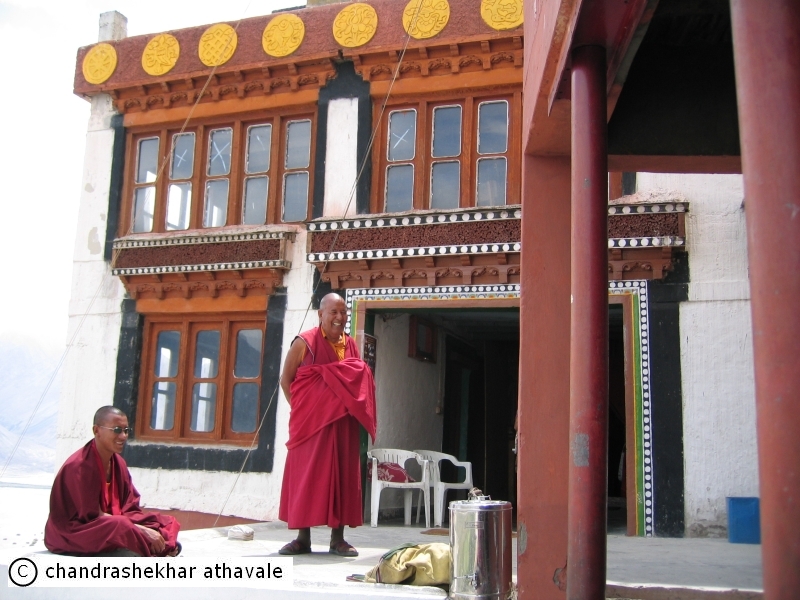 The wing on the left, houses a newly built large Du-khang, with a large image of seated Maitreya behind a glass case. On both sides, old manuscripts are arranged in glass cabinets. A Lama welcomes me here. I start talking to him and ask him few questions about Buddhism, Mahayana and Hinayana sects. He is a well informed and knowledgeable person and is able to clearly answer all my questions. I ask him about number of climbs he does everyday to the top of the Monastery. He admits that he does it only once a day as it is a rather steep climb. I come out of the hall and stand on the terrace. 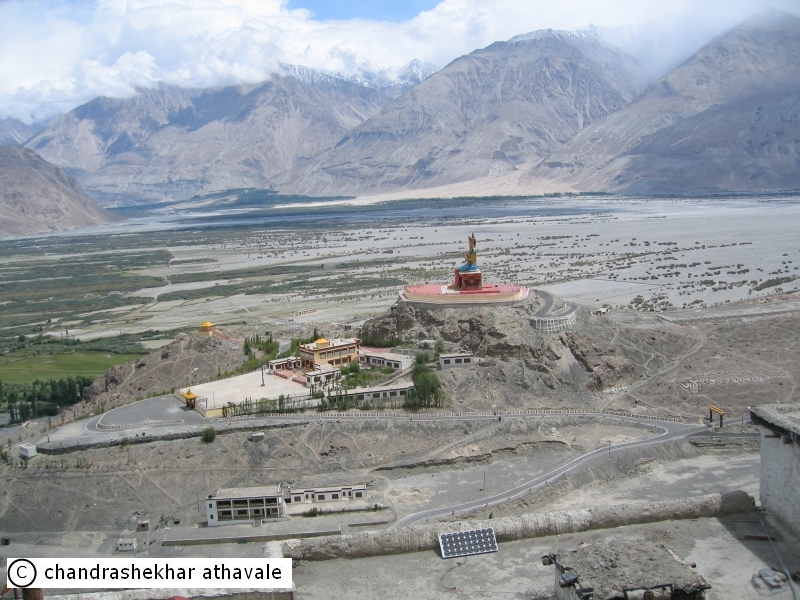 A breathtaking view of the Shyok and Nubra valleys is unfolding before my eyes. This view from here is perhaps the best and unmatched for grandeur, compared to anywhere else, I have seen in the world . Nearer to me is a huge statue of Maitreya built on a separate hillock. 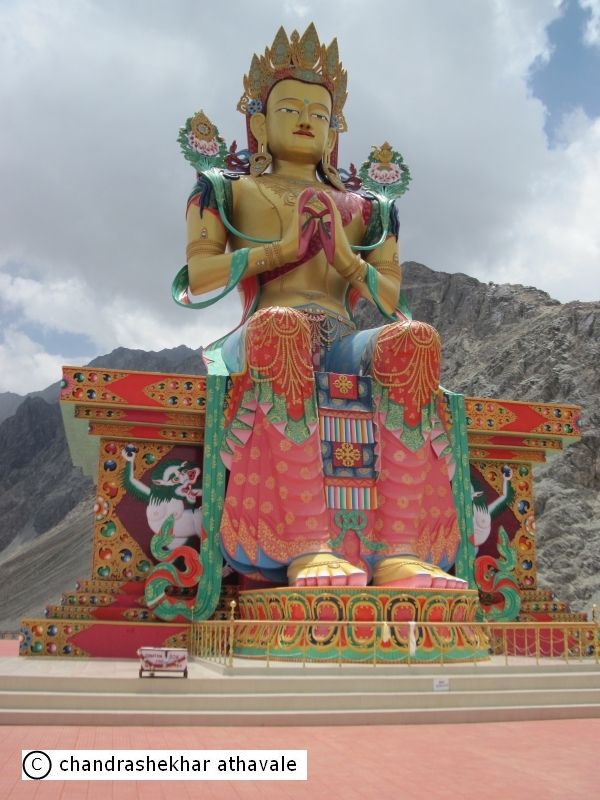 The Shyok and Nubra valleys stretch from this statue right up to the towering Karakoram range seen far away. The supreme wilderness of the landscape is so overwhelming that I can greet it only with complete silence. There are huge and tall mountains to my left, right and center. The whole scene looks like a grand amphitheater, where a play or a scene of a grand court of mountains is being staged and each and every actor mountain has just taken his stipulated place on the stage. With extreme reluctance, I start walking down the steep steps. On left, I see a shop run by the monastery selling little souvenirs like trinkets, key chains etc. I buy a few and walk down to the car. While on way back , I see again that elusive Karakoram peak. This time however, from our relative location and elevation, I guess that it must be the Arganglas Kangri peak(22273 ft). We stop at Khalsar for Lunch. I again order my favourite Thukpa soup and noodles. 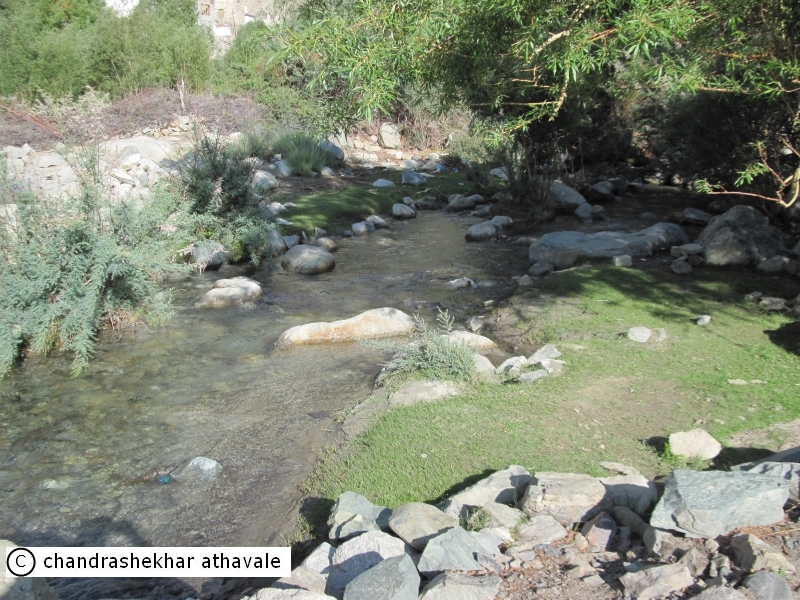 I have been asking our driver Tundup since we came to Shyok valley, to stop the car near one of the shrubs, which grow abundantly in this area. 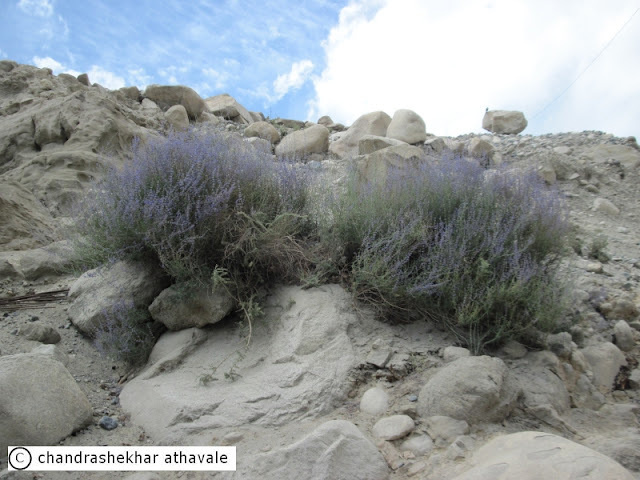 Finally, on the outskirts of Khalsar village, I get an opportunity to photograph some of these shrubs with beautiful blue flowers. Tundup tells me that it is called Burtse. 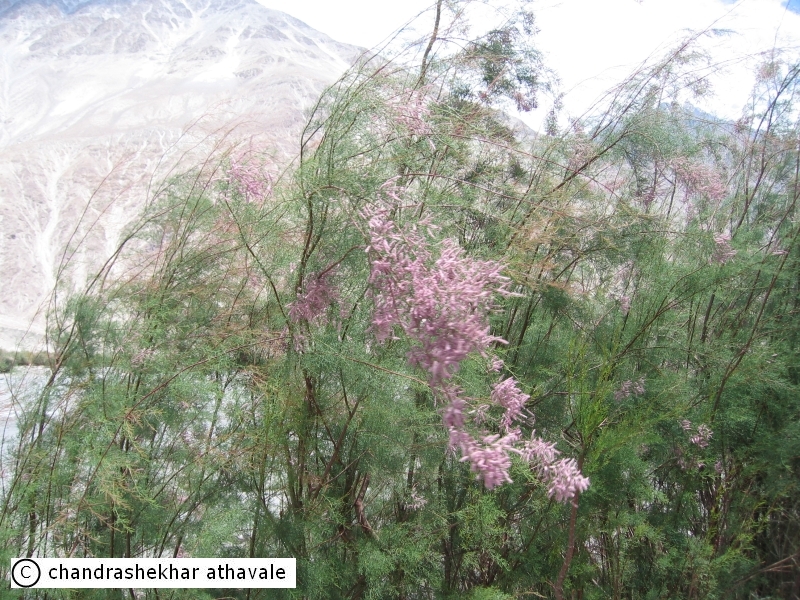 I have read somewhere that this shrub burns even in icy conditions and is used as fuel. Since I have no way to confirm whether the shrubs with blue flowers are really the Burtse shrubs, I just take Tundup’s word for that. 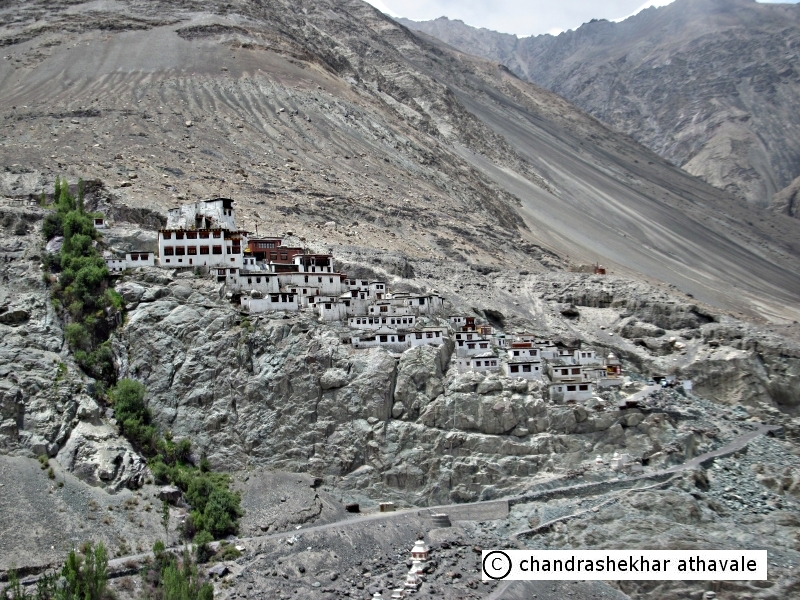 After lunch We leave for Khardung La again. I am feeling slightly disappointed though. I was quite confident, when we started for Nubra valley that I would be able to see at least some of the big daddy peaks of the south Karakorams during this trip. 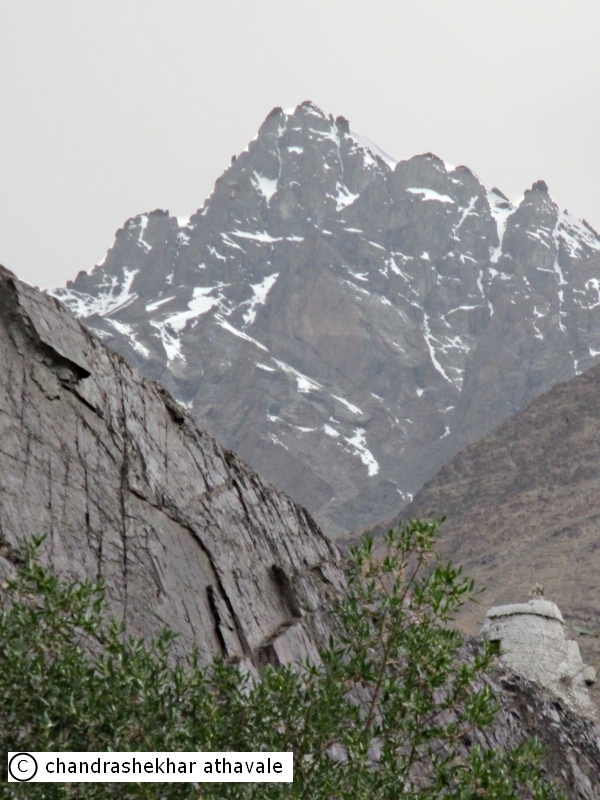 However except for few occasional views of Arganglas Kangri peak, all other Karakoram peaks have completely eluded me. I have seen scores of mountains and snow capped mountain peaks for last two days, yet the real big ones have remained totally hidden from my sight. With a feeling of slight dejection, I feel resigned to this situation, as we again start climbing the road towards Khardung La. As I reach the top of Khardung La, another surprise awaits me. 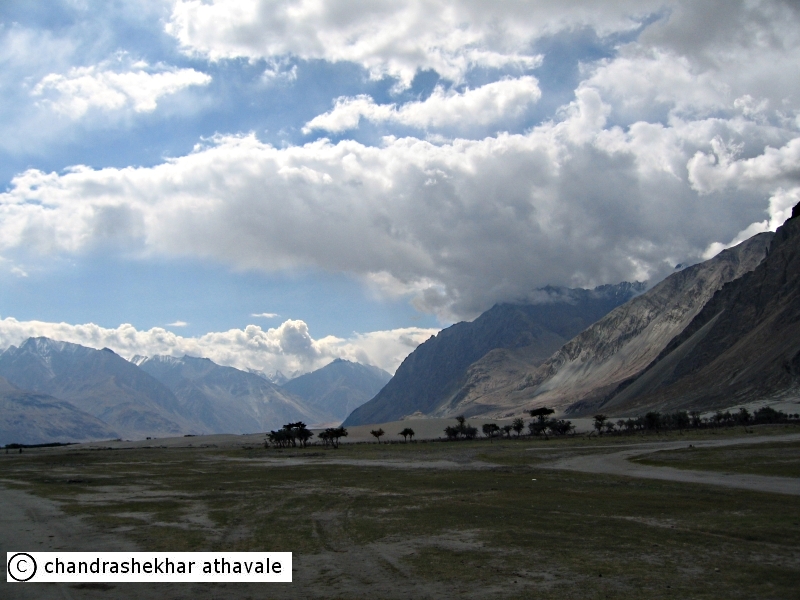 No one can really beat mother nature in Ladakh. Yesterday when I was here in Khardung La, it was snowing with chilly and icy winds with almost zero visibility. Same Khardung La looks so different today with bright sun shine and no trace of any snow or moisture. Couple of young boys are even playing a game of cricket for fun. I get down and walk towards northern end of the pass. To my greatest surprise, all the big daddys of Karakoram peaks, which have eluded me so far, are on full display today, glistening in bright sun light far away. I immediately recognize, Saser Kangri peaks I (25170 ft) , II(24650 ft) and III (24590 ft). A smaller peak perhaps is Chhushku or Chamshen Kangri and the one to extreme right is Arganglas Kangri without any doubt in my mind. I am extremely happy and feel contented that mother nature has finally granted my wish and I can see these grand peaks, which only few mountaineers can normally see. With a light and happy heart, I enter a cafeteria run by the Army, which serves free cup of Tea. 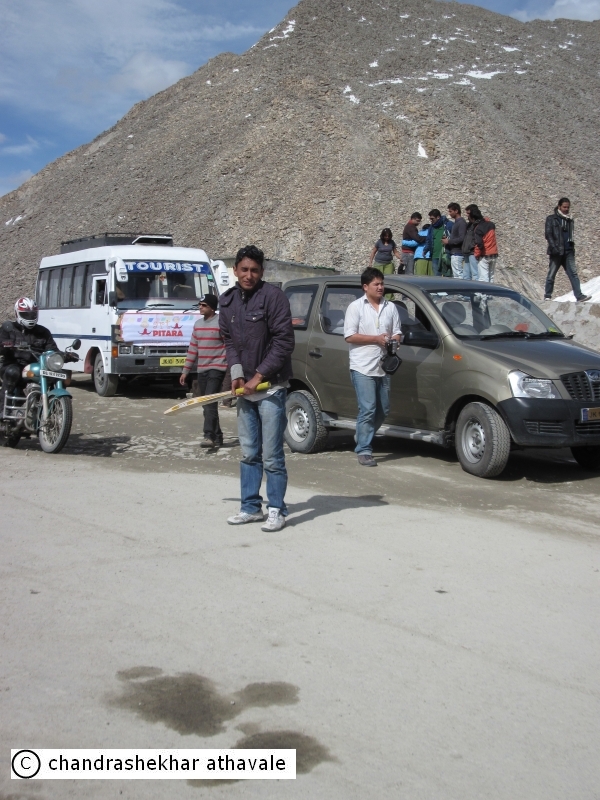 I purchase few souvenirs and Tee shirts for every one at home and say good bye to Khardung La. I reach Leh around 5 PM and remember that I have one unfinished business for today. Ever since I came here, I wanted to withdraw some cash from the State Bank ATM, yet I have found no time for this. I therefore rush to the market where State bank of India has 2 ATM machines. I am surprised to see a long queue before both machines even on a Sunday. I join one of the queues. I find that there are actually two queues. One for ladies and foreigners and one for others. Most of the people in queue have 3 or 4 debit or credit cards in their hands and are proxying for their friends too. I know that I am in a long haul and any shopping today would be out of question. After standing in queue for almost two hours,I enter the ATM booth. Normally only one person is allowed inside an ATM booth in most of the places. In Leh, any number of persons can get inside. There is no one to restrict the entry. When my turn comes, the machine suddenly displays a sign that it is temporarily out of order. My heart sinks, but there is nothing I can do. I walk back to the hotel postponing all purchases to the last day. My strong advice to anyone contemplating a visit to Leh, is to carry cash with you. Nothing else is accepted or works. Tired by this ATM experience, I eat early dinner and decide to retire early. Tomorrow we leave for Pangong lake.